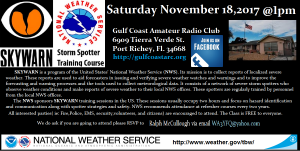 Want to become a SkyWarn Spotter or need your SkyWarn credentials renewed. Remember your credentials are only good for three (3) years. These include Pressure, Wind Speed, Latitude / Longitude, and more. Great tool for estimating winds speed. Provides an indication of a hurricanes strength based primarily on wind speed. Other factors such as flooding can be extremely dangerous. This site displays an animated view of wind currents anywhere on earth. To change the location on the screen, press and hold you left mouse button, drag the screen to the desired location, then release the mouse button. This unique site for maping tropical cyclones from satellite imagery is provided by the Cooperative Institute for Meteorological Satellite Studies / Space Science and Engineering Center at the University of Wisconsin-Madison. Computer Models like those used by the National Hurricane Center. Your 14.300.00 MHz Information Source. This Net operates daily on 14.300.00 MHz USB from 7:00 a.m. until 12:00 p.m. ET. This Net operates daily on 14.300.00 MHz USB from 12:00 p.m. until at 10:00 p.m. ET. This Net operates daily on 14.300.00 MHz USB beginng at 0300 UTC. This Net operates daily on 3.815 MHz LSB at 1030 & 2230 UTC. SATERN (Salvation Army Team Emergency Radio Network) provides emergency communications support to the Salvation Army wherever needed on site, at the local level, via VHF/UHF Nets. During wide-spread emergencies, such as hurricanes, earthquakes, forest fires, etc., SATERN activates for the purpose of handling emergency traffic as well as health and welfare information. The SATERN Net is generally operates on 14.265.00 MHz USB beginning at 15:00 UTC. Please check their web site to determine the alert status of the SATERN Net. The Waterway Net is sponsored by the Waterway Radio and Cruising Club which begins every morning for about an hour starting at 7:45 a.m. ET on a frequency of 7.268 MHz LSB. The main purpose of the Waterway Net is to encourage amateur radio communications to and from boats with an emphasis on safety and weather information. The impacts of hazardous weather are experienced by many Americans each year. To obtain critical weather information, NOAA’s National Weather Service (NWS), part of the U.S. Department of Commerce, established SKYWARN® with partner organizations. 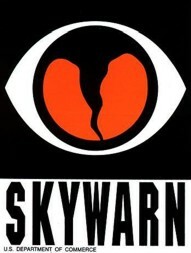 SKYWARN® is a volunteer program with nearly 290,000 trained severe weather spotters. These volunteers help keep their local communities safe by providing timely and accurate reports of severe weather to the National Weather Service. Three Training Options to become a Spotter for NWS Tampa Bay. Spotters should renew every 3 years. If you would like a NWS Tampa Bay Spotter ID, send us an Email after you’ve joined our member network and we will mail it out in 1 to 3 weeks.